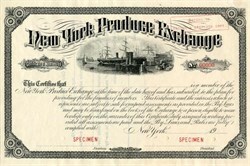 Beautiful engraved specimen membership certificate from the New York Produce Exchange dated 19__ . This historic document was printed by American Bank Note Company and has an ornate border around it with a vignette of ships in a harbor. The New York Commercial Association (established in 1861), was an institution later to be renamed the New York Produce Exchange (1868). 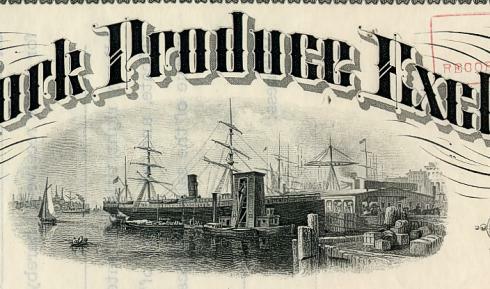 The New York Produce Exchange was the leading export market for American wheat, cotton-seed oil, flour and lard.